In the chilling adaptation of the best-selling novel by Thomas Harris, Jonathan Demme crafted a taut psychological thriller about an American obsession: serial murder. As Clarice Starling, an FBI trainee who enlists the help of the infamous Hannibal 'the Cannibal' Lecter to gain insight into the mind of another killer, Jodie Foster subverts classic gender dynamics and gives one of the most memorable performances of her career. As her foil, Anthony Hopkins is the archetypal antihero cultured, quick-witted, and savagely murderous delivering a harrowing portrait of humanity gone terribly wrong. Criterion Collection releases this special edition with a new 4K digital restoration, approved by director of photography Tak Fujimoto. It has audio commentary from 1994 featuring director Jonathan Demme, actors Jodie Foster and Anthony Hopkins, screenwriter Ted Tally, and former FBI agent John Douglas as well as many more special features. Shot outside Pittsburgh on a shoestring budget, by a band of filmmakers determined to make their mark, NIGHT OF THE LIVING DEAD, directed by horror master George A. Romero, is a great story of independent cinema: a midnight hit turned box-office smash that became one of the most influential films of all time. A deceptively simple tale of a group of strangers trapped in a farmhouse who find themselves fending off a horde of recently dead, flesh-eating ghouls, Romero's claustrophobic vision of a late-1960s America literally tearing itself apart rewrote the rules of the horror genre, combined gruesome gore with acute social commentary, and quietly broke ground by casting a black actor (Duane Jones) in its lead role. Stark, haunting, and more relevant than ever, NIGHT OF THE LIVING DEAD is back. 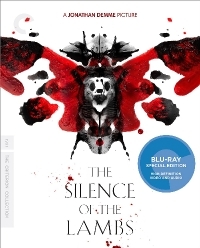 Criterion Collection releases this Blu-ray special edition in a new 4K digital restoration, supervised by director George A. Romero, co-screenwriter John A. Russo, sound engineer Gary R. Streiner, and producer Russell W. Streiner. There are two audio commentaries from 1994 featuring Romero, Russo, producer Karl Hardman, actor Judith O'Dea, and others and way more special features. Director Sam Raimi (The Evil Dead Trilogy, Darkman) returns to the horror genre with a vengeance in Drag me to Hell. Christine Brown (Alison Lohman, Officer Downe) is on her way to having it all: a devoted boyfriend (Justin Long, Jeepers Creepers), a hard-earned job promotion, and a bright future. But when she has to make a tough decision that evicts an elderly woman from her house, Christine becomes the victim of an evil curse. Now she has only three days to dissuade a dark spirit from stealing her soul before she is dragged to hell for an eternity of unthinkable torment. In 1970, young first-time director Dario Argento (Deep Red, Suspiria) made his indelible mark on Italian cinema with The Bird with the Crystal Plumage a film which redefined the 'giallo' genre of murder-mystery thrillers and catapulted him to international stardom. A staggeringly assured debut, The Bird with the Crystal Plumage establishes the key traits that would define Argento's filmography, including lavish visuals and a flare for wildly inventive, brutal scenes of violence. With sumptuous cinematography by Vittorio Storaro (Apocalypse Now) and a seductive score by legendary composer Ennio Morricone (Once Upon a Time in the West), this landmark film has never looked or sounded better in this new, 4K-restored edition from Arrow Video. Time is running out to save the greatest discovery in 200 million years! Join the thrilling expedition deep into the forbidding African jungle, where two modern scientists are on the trail of an amazing discovery! While studying rare fossils, they uncover a living, breathing legend - an enormous pair of Brontosauruses and a hatchling dinosaur alive in the heart of the rain forest! To protect this rare find, they must escape a world of unseen and certain danger. Through a tribe of mystical native warriors, and into the grasp of an evil scientist, it's the ultimate battle to survive! Screen favorites Sean Young (Blade Runner, No Way Out) and William Katt ignite the screen in this entertaining adventure of gigantic proportions! Bill Norton (More American Graffiti) directed this exciting adventure for the whole family, co-starring the great Patrick McGoohan (TV's The Prisoner and Secret Agent). It's been 15 years since the disappearance of little Francesca, daughter of the renowned poet and playwright, Vittorio Visconti. The community is stalked by a psychopath bent on cleaning the city of impure and damned souls. Moretti and Succo are the detectives in charge of finding the killer of these Dantesque crimes. Francesca has returned, but she is not be the same girl they once knew.